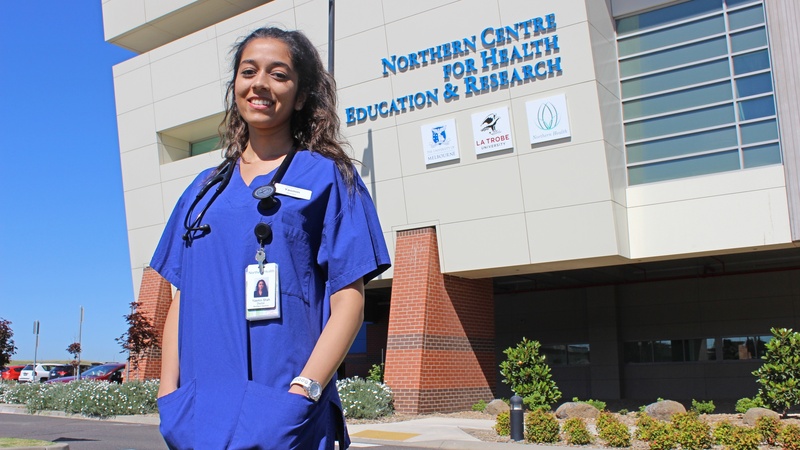 Epping local, Yasmin Shah, is one of our many excited medical interns starting at Northern Health this year. Yasmin feels privileged to have been a medical student with us for the past three years, saying the workplace culture has a strong sense of community at every level, which creates an invaluable environment for interns to thrive in as individuals and as a team of health professionals. “This allows for positive relationships and mentorships that leads to better patient care and also professional development,” she said. “During my clinical placements, I witnessed how this health service has been rapidly developing and enhancing its services. This is what made Northern Health one of my top choices for internship,” she added. Through her placements, Yasmin noticed that Northern Health has patients from such diverse backgrounds, who may sometimes feel vulnerable in an environment unfamiliar to them. “I am most looking forward to being a compassionate healthcare professional and striving to make all patients’ health journeys as comfortable and seamless as possible for them and their families,” she said. The future is exciting for Yasmin, as she finds many areas of health fascinating and has been fortunate to meet many inspirational health professionals who have fostered these interests. She is particularly passionate about surgery and aspires to be a plastic surgeon, eventually focussing on paediatric trauma and burns. “Along the way, I am determined to learn many different skill sets, especially the art of being a holistic doctor,” she said. For Yasmin, Northern Health represents a sense of belonging and a culture of contribution, and we are sure that all new interns starting their journey this year will have a significant impact on growing and sharing that culture.